On 15 October 2015, Mr. Mircea Ciopraga, Secretary General of the Permanent Secretariat of the Intergovernmental Commission TRACECA met with Mr. Dimitry Kumsishvili, Chairman of TRACECA National Commission in Georgia, Minister of Economy and Sustainable Development. Mr. Ciopraga expressed his congratulations to Mr. Kumsishvili on the appointment of the post of Minister and TRACECA Chairman and wished him success, prosperity and fruitful work during his post. 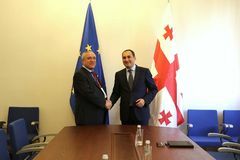 In the course of the meeting Mr. Ciopraga discussed with Mr. Kumsishvili his visit to Georgia on May 2015 and shared his interest to get familiar with the ideas and proposals suggested by beneficiary countries concerning the strategic plans and possible projects within the framework of TRACECA program. The Parties exchanged views on the possibility to enlarge TRACECA through the accession of new countries to TRACECA and to broaden the routes of the region. During the meeting with Mr. Ciopraga, Mr. Kumsishvili expressed its readiness to support the initiatives of the IGC TRACECA for the development of international transport corridor Europe-the Caucasus-Asia as it was during previous years.